Quantum Sails has a long tradition in the Snipe class and we are proud to be the leaders of sail development in this incredible class. Recent changes brought a new cloth weight for jibs and we worked hard to update our designs to account for the reduction in stretch that comes with a heavier fabric. The results show the Quantum jib to be up to the challenge. We are the only sailmaker utilizing a special Dacron developed with the German Olympic Team for the Star Class. Give one of our expert Snipe sailors a call for more information and to order yours today. Fuller in the top and middle than the C-5, the P-4 is a versatile sail through the range for the heavier teams and for those sailing in open water. An all-purpose sail, flatter than the P-4, best suited for normal and light teams. The Smaller Snipe sailors’ Sail. Building on the Success of the BW+ main that won the worlds in Japan, the new R-5 is more powerful in lighter air, and easier to set up in strong winds. The difference is in the outhaul control. In light air, you can have the power of the C-2F, but in breeze you can flatten the sail as much as you need to – while still keeping the head of the main open for easy steering and sheeting. The R-5 works well on a variety of masts, but is the hot ticket if you are running a Proctor Mast! This is the latest revision of the PS-5 shape that has proven fast for over a decade. It excels in light to moderate conditions. With the introduction of the new minimum weight, we have tweaked the sail slightly with a more open leech to account for the change in stretch characteristics. When you just want more power. This is the fullest jib we have, and with the added Radials, the shape stays flatter through the wind range. A quick sail in open water, but also fast in flat water and light air when frequent windshifts require the need for constant acceleration. George grew up in San Diego racing Stars, Lasers and Snipes. As a kid, he made sails for his model boats before eventually taking a part-time job with Quantum during high school and college. He came on full-time in 1993 as a sailmaker and designer. Using the latest computer design programs, George is able to create the fastest, most efficient sails for smaller One Design boats. This technology, combined with his intimate understanding of One Design sailing, allows him to create the most versatile sails available. 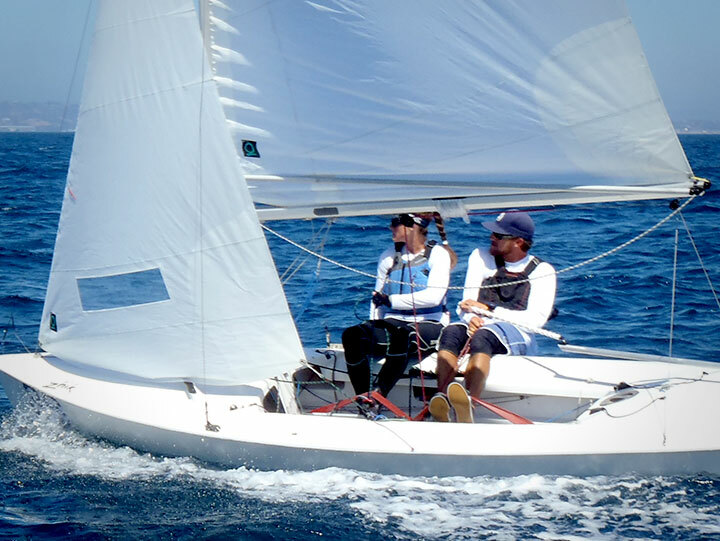 The San Diego loft designs a variety of One Design sails, including Thistle and Lido 14, but their specialties are Olympic Class Star and Snipe boats. George is the 2009 Star World Champion, as well as an 21-time National/North American Champion. In addition to his sail-making abilities and wins, he is also an accomplished keelboat tactician and trimmer.